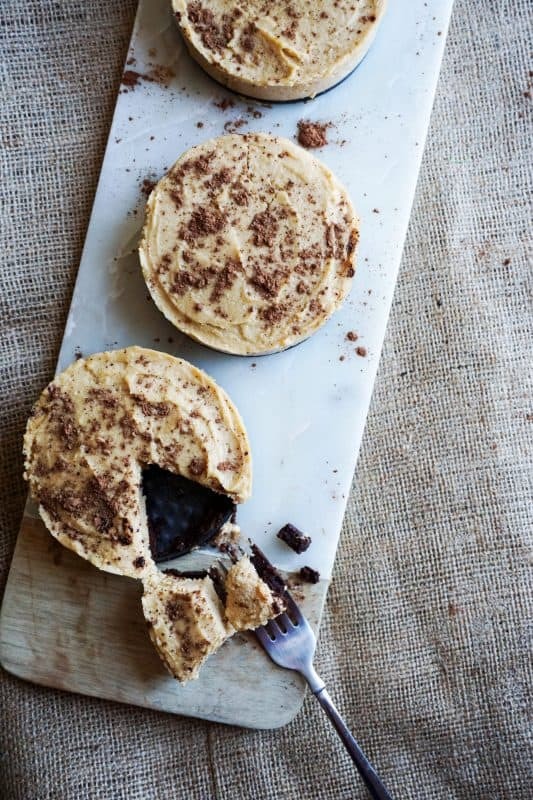 Our Low Carb Peanut Butter Pie is rich and creamy, and sure to please everyone! As any pie should be, we made the filling a 5 to 1 ratio to the crust. That means more peanut butter for you! The ingredients don't get much simpler than what we have here - all you need for the rich, creamy filling is peanut butter, cream cheese, heavy whipping cream and some kind of sweetener, which we know you have all of! Surely you can walk into your kitchen right now and whip this pie up to be enjoying it in less than an hour. The Perfect Duo: Peanut Butter And Chocolate! When it comes to food we know the star couple, the Brad and Angelina if you may, are chocolate and peanut butter. Separately they move mountains, together they rule the world! We created a subtly sweet chocolate crust to complement the smooth and rich peanut butter filling. And, the secret key to this filling is the addition of cream cheese! We knew just how powerful this pie would be even before we tried it, and we kid you not, this low carb peanut butter pie is what dreams are made of. Low carb desserts have come to become something Matthew and I like to test out weekly. There is always something richer, creamier, easier to make and lower in carbs. If this rich, high fat, modest carb dessert doesn't fit you liking then you'll have to give our Protein Cakes and Chocolate Peanut Butter Fat Bombs a try! For this recipe, and for many of our recipes we like to envision the photos before we start cooking or baking. We want to provide you a real look into our foods by using the necessary cookware that will allow this. For these pies we used three 4-inch springform pans. If you're not a mini springform pan person like us, you can also use this 9-inch springform pan we contemplated using instead! Recipe can be quickly added to MyFitnessPal - Search "KetoConnect - Low Carb Peanut Butter Pie"
In a bowl add butter and melt. Once melted, add the almond flour, coco powder and liquid stevia. Combine. Mold into the bottom of 3 4inch spring form pans (what we used) or a 9/10 inch springform pan. Bake at 350 for 5 minutes. Remove crust and allow to cool. In a separate bowl add room temp or softened cream cheese, peanut butter, erythritol and heavy whipping cream and combine well using whisk or hand mixer. Pour over cooled crust(s) making an even layer. Freeze pie(s) for 30 minutes.